It’s only when you go back into the country that you realise now noisy cites can be. Even if you wake in the night, it’s rare for the background hum of cars to be silent. You may jolt awake thinking, “what woke me?” to hear the hoo-ha wail of a fire engine or ambulance. It may be the noisy clatter of possums on the roof, or the animated chatter of party goes, weaving their way home. But it is rare to wake to anything resembling silence. It was chill outside, but warm in bed. Unfading bright light leaked through a gap in the curtains. I could tell that it was a blue-sky day and that the scudding clouds of the day before had blown away. And by the silence, I could tell we were in the country. Then a cow mooed and the kids laughed at the comedy of the unfamiliar sound. It did not have the deep resonance of the cartoon moo beloved of TV shows. It was more a bellow of shock that spoke of ambush or surprise. Almost inevitably the small people starting impersonating the cow. Laughter. The world could no longer be described as silent. Down hill from the back of the house, the rough green fields ran into a small wooded valley that hid a stream. A wire fence, marked at its four corners with wooden styles, separated the garden from the field. Sal said she thought the styles looked English. I said I thought they looked normal. I suppose we were both correct. If you ignored the calls of the Black Cockatoos and turned a blind eye to the gum trees, the landscape looked English. A small landscape of folds and fields tended and farmed. I started to remember the things I no longer see. Such a reaction is probably a form of landscape-sickness, rather then home-sickness, and I immediately feel somehow saddened by the intrusion of thoughts of there when I am here. How long do I have to wait before the comparisons fade and I don’t reach for references well past there sell by date? Landscape-sickness indeed. In the valley floor woodland, the trees were bent and old, covered in moss, with branches that reached down into the leaf-rich soil. It was a place where you could hear water trickling and dripping even when you were stood away from the stream. The damp greenery reinforced the vision of England. A fleeing swamp wallaby shattered it. Thornbills, tiny and suitably sharp, moved in talkative groups through the canopy. Such places as this put me between two worlds – the world of memory and world of now. My kids jump the stream and climb the mud formed path. They are both better clothed and healthier than I was at the same age, but they both have the same desire as I did (do) to look into holes in the ground and wonder out loud about what made them. They both collect eye threatening sticks and muddy shoes. They both carry cut knees and scratched shins with unfashionable pride. This place may remind me of my childhood, but to go there in my mind, when I am with them in their own world, feels like a form of abandonment. I need to leave memory for another time. I need to get my knees dirty too, looking down a wombat hole. I need to leave the “do we go left or right?” decisions to them as well. When all roads lead to Rome it does not really matter which way you go, because eventually, you will come home. Above the damp of the stream bed the land opens to ferny heathland, studded with single gum trees and the occasional blow in birch. On the open ground pellets of rabbits and wallabies have been left behind. At a stone that forces its way through the soil an edge marker has been left by a fox. The memories of the now and then blend with the evidence on here and there. 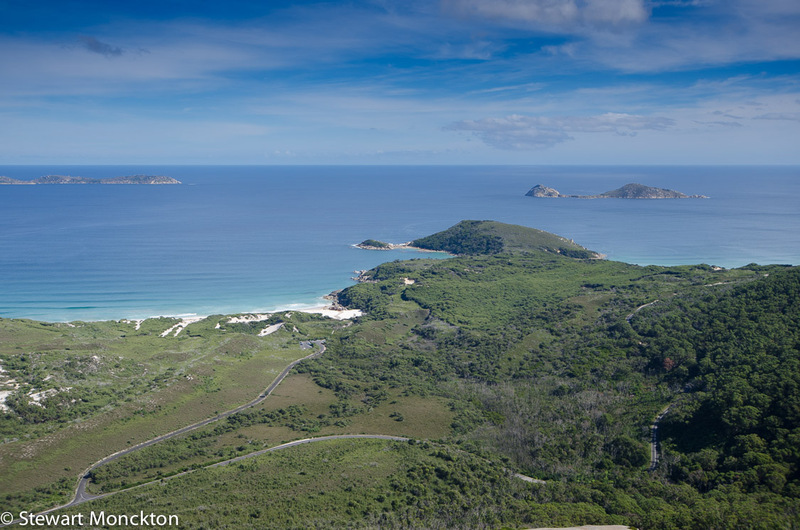 From the clearings on the hill there are long views over the sea towards Wilsons Prom. In the crown of a mature gum tree a small flock of smaller birds half fly and half walk along the branches. Individual birds spiral along the limbs, pecking here, picking there. The birds are Varied Sitellas. On a dull day these bird would pass for nuthatches, birds that do not occur in Australia. Cogs spin and something drops into place. For all the differences between here then there, the nature of nature makes things the same. Convergence from distance points to arrive at (not quite) a singularity of form and function. The two birds, only distant relatives, have come to use the same niche in different lands. Surely, in such ecosystem of interest there is a niche here for me as well. Another wallaby spooks from cover. The sitellas turn tail and fly away. In the distance the black cockatoos call. Interest enough I’d say. That evening a blood moon rises through a heavy sky. We see little but brief glimpses though breaks in the cloud. The Moon looks purple and blue, like a two-day-old bruise on the road to fading. The next night is almost cloud free and in the early darkness there is a better lunar show. A fox walks over the lip of a slight hill and pauses, all concentration and bright busy tail. It lifts its head to sniff the air, a short, dog like gesture. Wood smoke and cooking smells. Humans and maybe even a hint of whisky – Scottish, thick with peat and a second layer of smoke. Whatever it smells, it’s too much for the fox, who turns brush and leaves. Minute by minute the Moon creeps higher, painting the landscape with a pale silver wash. Kookaburras cackle in the distance. Burning logs shrink and settle in the firebox. The chill air smokes my breath. I step inside to warm air and bright light, as a cow moos goodnight to anybody who cares to listen. Early the next morning the dairyman’s clock calls again. The low gruff call a counterpoint to a high pitched twittering that flows all around the house. The staves of the wire fence are dotted with musical note welcome swallows. Each with their own space, they don’t huddle like the pictures in kids books and bird guides. Some look softer and fluffier than their not too near neighbours, I suspect they are this years birds, heading north from Tasmania for the first time. An autumnal internal exile for this spring bird. 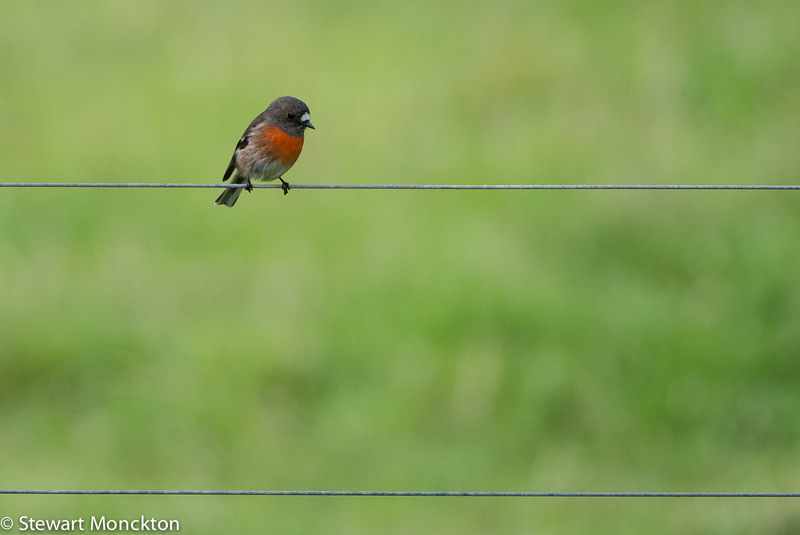 At some unhuman signal the birds leave almost as one, leaving the fence to a scarlet robin and his wife. At the gate out on to the dirt road we have a choice – left or right. Lighthouse or hill. We choose to go right, we choose the hill. 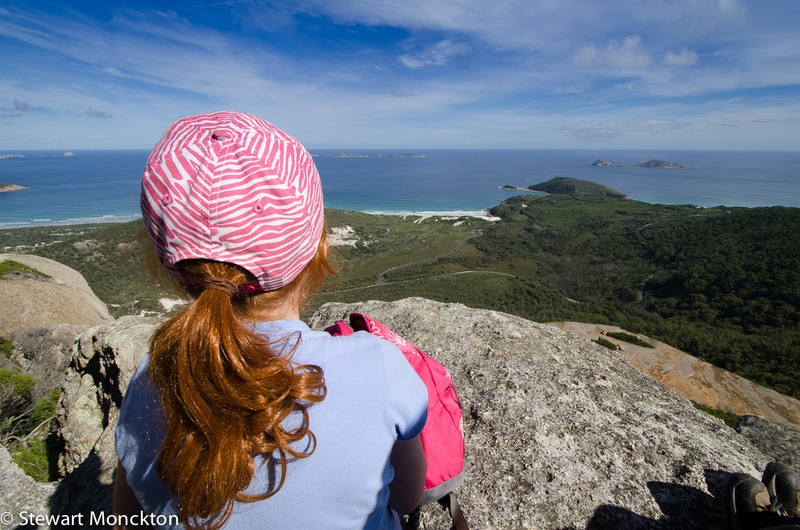 Mount Bishop overlooks Tidal River, the busiest part of Wilsons Promontory National Park. The car park at Tidal River is busy with people and vans. Some people are coming back from sandy beach walks, but most are getting ready to start a journey. We just want to buy some jelly snakes – the Lembas Bread of our family walks. At the beginning of the walk we check we have enough water and (of course) jelly snakes. Everything is present and correct as we walk along the start of a well made, gravel crunchy, path. Grass-trees, which are neither grass nor tree, line the side of the paths. The rough leaves only let you run your hand one way along them – like stiff cat hair, rubbed the wrong way. I am surrounded by the shuffle crunch footfalls of my family. In the distance I can hear the muffled crump of waves breaking over rocks; of the sea at war with the land. Birds call from the dry brown leaf litter, from the open branch treetops and the open blue sky, high above. Such days are rare. Such days are a gift given to us by nothing and no one. But they are gifts none the less. The path leads into the cool shadows of tall timber and keeps our backs to the sea. To the left the land slopes up and away towards the top of Mount Bishop. To the right the land falls steeply away towards a sometimes stream. A view of the roots and the canopy from a single path. The anchor and the sail. At a path junction we stop for a drink of water and a taste of way-bread. A left at the junction starts the climb up the hill. Cutting the contours gently the path weaves a seemingly uncertain path towards the summit. It’s not a tall hill and it’s not a long path. Purple mushrooms with a slick sheen distract us from the journey. Parrots in the canopy call to each other, in bright feather conversations. As we round the shoulder of the hill the sea comes into view, studded with rounded, granite islands. Bare patches of the same stone form parts of the path, smoothed by the passage of feet in some places, thick with moss and lichen in others. The bones of the landscape show through the growth. It’s a stone that calls to be touched, by more than just feet. At the summit we sit to eat simple sandwiches and take in the view. Both are world class. Both feed a necessary hunger. Finger headlands stab outwards to the sea, webbing beaches of pale sand fill the gaps between the digits. To the south lie the islands of Tasmania and the open waves of the southern ocean. This is place to breathe deeply on the cleanest of clean air, even if, deep down, I know that it holds the faint taint of industry. A silver gull drifts overhead, drawn no doubt by the chance of crumbs and gifts of crusts. A dozen shades of green, washed with grey, blue and white. Golden yellow rocks pounded down to golden yellow beaches. A light wind, which if it held colour would be silver. A bright autumn day. The distant beaches hold few people, and the path to the summit was almost empty. We saw just two other families on the path to the top – and on the journey down we see none at all. On days like this is there is barely any need for the jelly snake incentive. But the lack of need increases the enjoyment. Down on one of the beaches the sand is noisy underfoot. 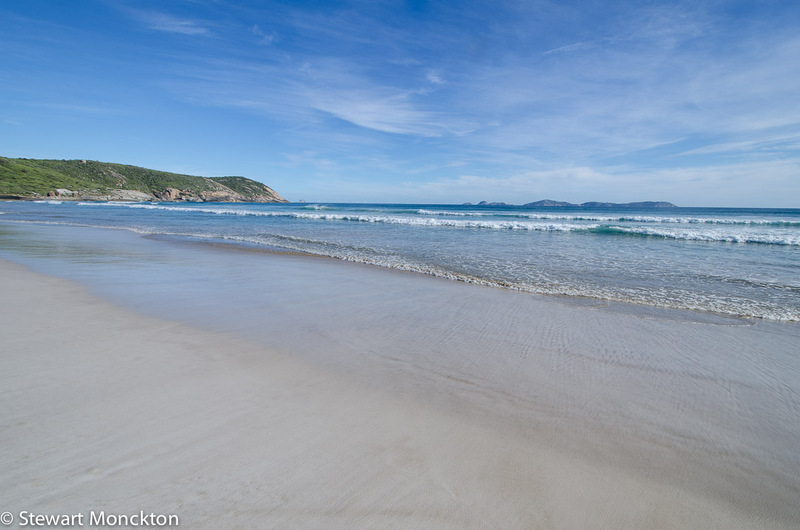 The whim of tide and time has sorted the grains, so that all of the sand on Squeaky Beach is of a similar size. And when they roll over each other – pushed by sliding feet – they squeak in answer to the movement. Most of the few people who are on the beach can be seen walking, flat footed, in the dry beach top sand. And the beach squeaks back its answer. People gather at one end of the beach; human moths drawn to the spectral charm of the still close car park. With at least a kilometre of beach to choose from, people sit within blanket flicked sand range of each other. Two hundred paces down the beach there are few scuffed footprints and even fewer people. The shouts of children fade behind me. The waves hiss over compact sand. I walk to the far end of the beach to look for sooty oystercatchers. 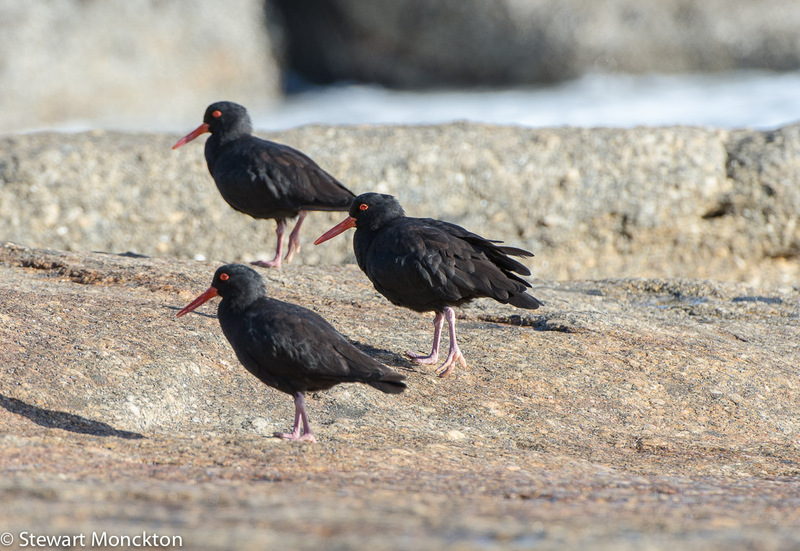 A trio of these chicken sized birds stands on the waves cleaned rocks at the end of Squeaky Beach. Waves run up deep gullies between rounded rocks, and the birds seem happy to keep water between them and me. They have impressive red beaks and a ring around the eye – otherwise they are a silky black that holds onto the light with a surprising vigour. In certain lights they can look like bird shaped black holes moving about on an illuminated field, a kind of shadow puppet. The birds are pushed down onto the un-favoured sand by a passing of a group of walkers. As the walkers shrink in the distance the birds give up their wave rhythm beach run and fly back to the rocks. It’s clear where they feel at home. I leave the birds to their oysters, their rocks and the waves. Halfway back towards the crowds, a brown blocky shape moves slowly at the angle where the beach turns to dune. A person stands next to the shape, holding their arms in front of them in strict point and shoot camera stance. The blocky shape ignores the person. I sit down a few meters away and the shape ignores me too. Once a wombat is feeding it may be one of the more single-minded animals in the world. Fine green blades push up through the pale sand, and the wombat grazes with a surprising intensity for an animal with such a small brain. A small crowd soon gathers; wombats are the star animals of Wilsons Prom. Most people do as I have done and sit down to watch. The wombat ignores the crowd and keeps eating its sandy snack. A child – a girl – arrives and slowly walks closer and closer to the wombat, which ignores her. She holds out her hand in classic “pat the cute animal” stance, and moves forward again. Remarkably the wombat does not move as she pats it on the back. More people arrive, and a general feeling of surprise grows at this display of marsupial tolerance. The girl’s sister and mother arrive and join in the fun – which pushes the wombat over the edge of its tolerance range. It moves a couple of metres away at surprising speed, stops and beginnings feeding again. The mother gives each of the girls a bag of carrot sticks, which they start to throw towards the wombat. It completely ignores their gifts, which upsets the girls. They throw the remaining carrots at, rather than to, the wombat, which continues to ignore their offerings. At this point my blood pressure is only a little above normal. Now the first girl throws down the empty carrot bag and strides towards the wombat and tries to pick it up. This is a brave, even foolhardy move, given the relative sizes of the two animals involved. Unsurprisingly the wombat does not take well to this advance and dashes up a wind blown gouge in the dunes. Both girls and the mother chase after it! At this point my blood pressure is rapidly moving into the near fatal region. My kids arrive just in time to see the wombat turn tail and run into the dunes. When a nine year old looks at you and says, “Why are they doing that? Are they stupid?” you know that there is some pretty dumb adult behaviour on show. I can hear calls of encouragement and squeals of excitement coming from on top of the dunes. I’m sure none of this noise is coming from the wombat. I’m at loss what to do. Challenge the behaviour and risk conflict that will solve nothing. Ignore the behaviour and walk away feeling like a moral coward. I tread a middle road and talk to some of the people around me – they are as shocked as me. One man, my age, but taller, says very little. I ask him what he thinks – and he says that the “girls are just having fun”. I say that I would not mind hearing the wombat’s side of things. For a brief second he smiles, but then he works out that I’m not joking. He walks away, to be joined by the adult and the two young girls; his wife and kids it seems. I can’t help but think that some people should watch more TV and play more computer games. It really would be better for everybody. There are kangaroos and emus on the way home, but no more wombats. At the gate off the dirt road I wonder what we would have seen if we had chosen the lighthouse. It's not so many decades ago that someone could have shot the wombat and no one would have thought anything of it; so I guess we're making some progress, just a pity that some people have got left a little behind the others. I recognise the "landscape sickness" you write about and wonder if all this uprooting of people from their home regions has caused some damage. If so then the original inhabitants of Australia will have been proved correct. One of the things I most love about living in the country is the sounds of nature at night, as opposed to cars, sirens, etc. It is for this reason that I will never wish to live in a city. That view from the summit is incredible, and I love that scarlet robin. Beautiful post - you really grabbed it by the throat. Thanks for taking me back. This was as gorgeous a ramble with you and family as ever, Stewart... the final incident would have bothered me too and it always so difficult to act according to our principals in such situations, particularly if there were no official signs warning against such behaviour. Wonderful photos today! I enjoyed the narrative too! Stuart, I'm a new reader as you know, and this piece is just magnificent. There's so much about it that resonates with me. I had an encounter similar to yours in Glacier National Park in Montana when a 12 year old boy was throwing rocks at a marmot. Before I knew what was happening, my mouth opened and I scolded him and told him to stop that! His father, who was standing by and watching, took exception. However, the boy stopped immediately and looked sheepish. You see, the marmots are accustomed to people on the boardwalk and was within only a few feet when being assaulted by the rock thrower. I'll be looking forward to more of your insights. When I first came to Australia it was the wombats that took my heart - well everyone loves the koalas and kangaroos so I thought I'd be different... and probably because you can get up close to them in the wild, especially at the Prom. You are a better man than me, in our family I would have said something to the mother, which would have resulted in me feeling better for saving the wombat from human torment and the carrot sticks, until the kids proclaim that was so embarrassing and refuse to talk to me on the hike home!!! I really enjoyed your post, with the sound of silence and the landscape sickness. Wow how stupid can humans be sometimes. Interesting narrative… a pity about the kids and the Wombat - humans can really be annoying, sometimes. A wonderful post Stewart - brilliant narrative. I quite honestly would have been beside myself over the wombat. We have not come far enough me-thinks. Oh, I love the sound of silence. Those minimalist birds on wire shots are amazing! As humans, we sometimes prove ourselves to be the dumbest of all species. The sad thing is, the people involved did it with the best of intentions, and in their own misguided way were attempting to connect with nature. I think that every school should have a course dedicated to interactions wiith wildlife! Thank you for posting your accounts and pictures of places I'd love to go to myself but will never get to see in person. I once lived in Melbourne and Perth but now live in my birth place in Canada. As I read your blog, wonderful sounds and fragrances are recalled, so you could say I have enhanced appreciation. I will be following your excellent descriptive journal from now on! Regarding the wombat, I can identify completely with your dismay of insensitive behaviour towards wildlife. I could feel my own blood pressure climbing as I envisioned the event. I will take a cow's moo over a car's horn any day of the week! These are gorgeous shots Stewart- and I am just as shocked as you with those people. Over the years I have seen more stupid behavior from grown adults who ought to know better. Many times I have wanted to say something but didn't. I should have. Wombats are such wonderful, cute, beautiful creatures...they hold me in awe. People...well, they are something else again...and I can't describe them or their behaviour as I did the wombat - unfortunately! Oystercatchers I could watch for ages, too...in silence...and have done many times. On Fraser Island the Pied Oystercatchers are called "Wongs" - because they eat the pipis...which, on Fraser Island are called "wongs". When I lived on Newry Island I used to get great pleasure out of watching them bathe in the little pools of water left after the tide had gone out. One would call out to its mate...beckoning it to join in. They were great to watch. Sorry I haven't come more often to visit your blog, I've soooo busy! 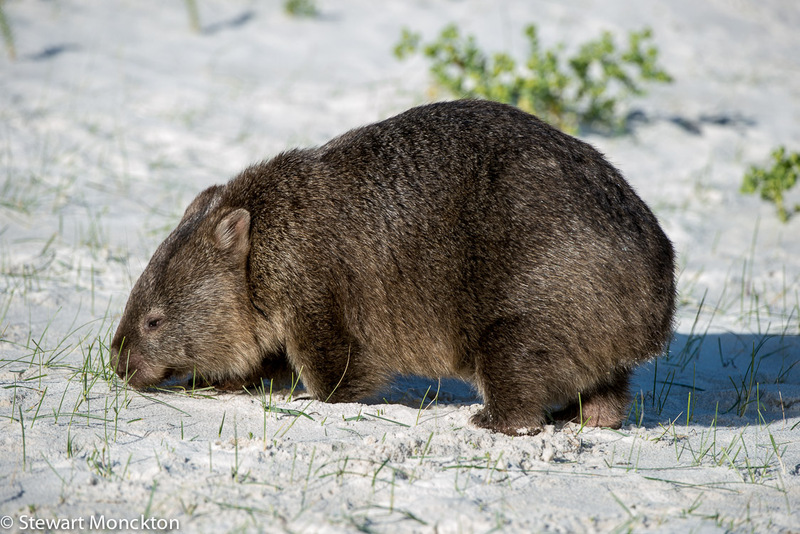 What a wonderful post with a huge surprise at the end with the wombat on the beach! Your previous posts are stunning too! Some children act oppressively to any animal they meet. Perhaps they torment a cat at home and no one corrects them since it gets them out of their parents' hair for a while. Respect for animals needs to be taught, too bad when parents won't. My blood pressure would have gone up too. I enjoyed the walk to the beach and birds along the way. The Superb Fairy Wren is such a beautiful blue, and the wombat is adorable. Wombats are such wonderful, cute, beautiful creatures. I would have scolded the children and not cared what the parents thought. If I was with friends, a least a few would back me up. One in particular would also collect the carrots, adding a lecture about feeding wild animals and littering.